Our protagonist is Annie Leonhart, the girl with one facial expression. (Hint: it's not a smile.) She looks like a corpse that's been hauled up on its feet, but don't underestimate her. She belongs in the grim, survivalist world of this show and she'll break your shoulder if you ignore her questions. Here she's working for the Military Police in the Stohess district and she's taken a missing person case. She's actually a surprisingly good detective and the story is a properly developed investigation (talk to suspects, follow up clues, etc. ), although it doesn't have a nice, normal ending. There are two lost girls here: the missing person and Annie herself. We see her childhood and her father's brutal training. When this went wrong and she irreversibly damaged his legs, this has the unprecedented effect of making him sound happy and paternal. "Well done, Annie. I know you'll keep getting stronger." Do not watch this if you haven't seen Season 1 of the anime. Massive spoilers. You'll be fine with this, on the other hand, if you've seen the first third of Season 1. That said, though, I'm not sure what the story's supposed to be. 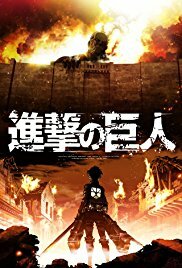 "Wall Sina, Goodbye" has a straightforward plot, but this one's jumping back and forth in Mikasa's life and perhaps also alternate realities. I honestly couldn't say. "You couldn't accept SPOILER, so you created this world." Eh? Is it all just a big hallucination? I don't think history's changing or anything like that, though, because this isn't that kind of series. It's mostly telling the story of Mikasa and Eren's childhoods together, but there are also scenes set during the struggle for Trost (I think) and a mirror-faced hypnotist who promises to turn a sweet young girl into a killer. It's okay. It's not obvious what's going on, but it's still perfectly watchable. Is this a good series? Sure. It feels like proper Attack on Titan, even if it's mostly avoiding Titan splatter warzones. It's got the same tone, the same dramatic weight and the same production staff as the parent TV series. It's just a couple of side-stories, of course, but I don't see any reason not to watch it if you're already watching the main show.